Cloudy early with scattered thunderstorms developing this afternoon. High 77F. Winds SSE at 10 to 20 mph. Chance of rain 60%.. Variable clouds with showers and scattered thunderstorms. Storms more numerous this evening. Low 63F. Winds SSE at 10 to 15 mph. Chance of rain 50%. The View, a massive upscale apartment complex on the edge of the Baylor University campus, already has attracted more than 700 lessees, most of them Baylor students. 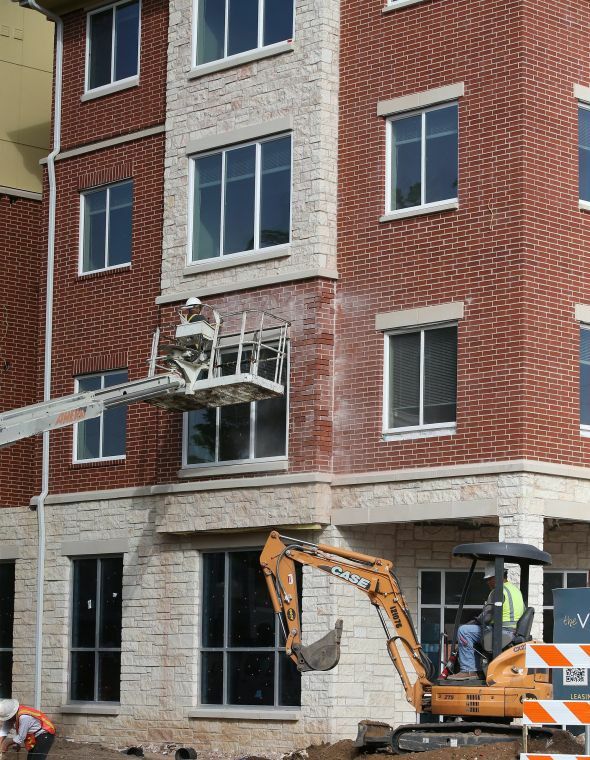 Work crews continue to apply the finishing touches to The View, a 550,000-square-foot apartment complex in South Waco. At 550,000 square feet, and with an eight-story parking garage towering above its midsection, The View looks like a dormitory on steroids. But the edifice of stone and brick that seems to swallow a block in South Waco is not the handiwork of Baylor University, though students will dominate its population. “It’s open to anyone, but students, especially Baylor students, make up 98 percent of our prospective occupancy,” leasing agent Amy Hartstack said. Its full name is The View on 10th because of its proximity to that street, with the complex also abutting Speight Avenue. It features 257 apartments and 718 bedrooms, 708 of which have been pre-leased. Students likely will begin occupying the complex the week of Aug. 18, just in time for fall classes. “The project should be completed by the end of the month, subject to punch-list (construction) items being completed,” said Brad Copeland, president of Dallas-based Copeland Commercial LLC and a partner in the multimillion-dollar venture that includes participation from New Jersey-based University Student Living. USL is the campus housing company of The Michaelis Organization and has been involved in projects valued at more than $3 billion. “They are 50-50 partners,” said Copeland of USL, though he declined to get specific about how much either he or USL has invested in the complex. Copeland, a Baylor graduate who majored in finance and information systems, said he approached USL about what he perceived as a golden opportunity to place an upscale complex within walking distance of the campus. “That was a niche I felt had not been served,” he said. He said the fact that Baylor is enjoying success academically and athletically, and growing at a controlled pace, made selling USL on the venture a breeze. The View has gone up on about 4 acres where crews demolished the old Varsity Square apartments and several aging two-story homes. 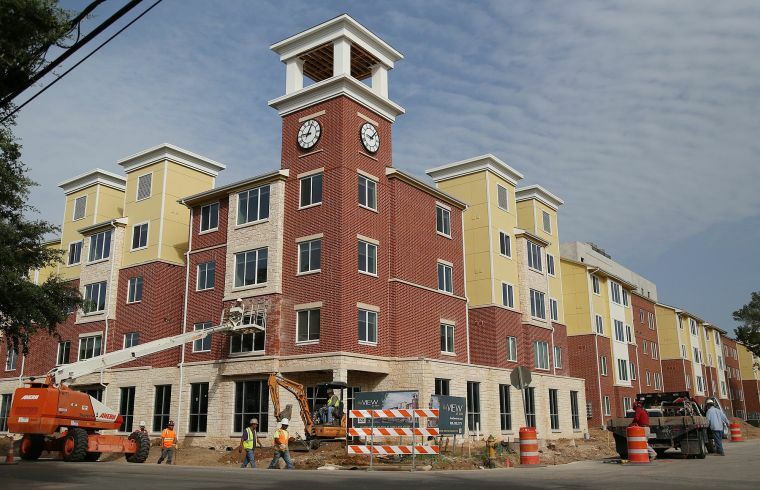 Since Copeland announced his plans, Baylor has completed construction of its own housing complex called East Village, which opened in fall 2013 and can accommodate 700 students. Possibly inspired by the tony View, a development called The Verandas on Speight is taking shape nearby. Its website promotes it as “premium houses” in a gated community with sport courts, a swimming pool, spa, hot tub, 10-month lease option and access to Baylor-area trolley service. Jo Otto, co-owner of Food for Thought, a pizza and sandwich shop at 1121 Speight Ave., watches and listens to what is happening in her neighborhood with great interest. “I hear the construction workers as they walk across my parking lot, and they talk about how nice The View is. They say it’s really something,” Otto said. She wants to take advantage of its arrival by launching an online ordering and delivery service for busy students. Those living at The View also will find themselves within a short stroll of Domino’s Pizza, Shipley Donuts, the Dancing Bear Pub and Shorty’s Pizza Shack, among other eating and drinking venues. “It’s a little more Austin than Waco, with that half-brick, half-stucco look,” said Paloma Pearson, 25, who was jogging this week near The View. Pearson is pursuing a master’s degree in business administration at Baylor, having performed her undergraduate work at the University of Texas. Copeland, meanwhile, said he sought to ensure the architectural design of The View would blend in with campus buildings with their heavy use of red brick. Hartstack said monthly rates in The View are $1,180 to $1,190 for one-bedroom apartments; $700 to $720 per bedroom for two-bedroom units; and $605 per bedroom in four-bedroom apartments. Those rates include use of the parking garage, said Hartstack, adding that only one-bedroom units remain available. Amenities include a fitness center, Internet cafe and a study lounge with private and group study rooms. Copeland said The View also offers a resort-style pool and hot tub with poolside cabanas; scooter and bike racks inside and outside; free tanning facilities; and controlled access to the buildings and a roommate matching program. The first-class perks inside and outside the apartments “make this the largest ‘Class-A’ student housing community ever built in Waco,” Copeland said.